The rising singer/producer talks Dr. Dre, Compto’'s reception, and the benefits of being prepared. Nothing has been the same for Anderson .Paak since the not-insignificant supporting role he played on Dr. Dre's Compton soundtrack—he appears on six of 16 songs—landed him on a much bigger stage than he had previously known. The L.A. musical polyglot recognized the position he was in and began releasing music at a quick clip. 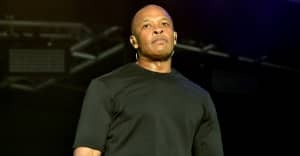 "Prior to [Compton], all I had been doing was just recording music," he explained to The FADER during a recent conversation about working with Dre and Compton's lukewarm reception. "I had all my tunes, like, in my sack and it was perfect timing. I felt like I was prepared." It appears that his preparation has paid off: earlier this week, .Paak announced that his new album, Malibu will be out early next year. But first, he has released Link Up & Suede EP with his long-time accomplice Knxwledge. Cop that here and check out our video with .Paak above.